This past Sunday, My roommates and I threw our first house warming party! We wanted to throw a house warming party because 1) We are in a totally new townhouse complex 2) We moved to OREM!! 3) We wanted to show everyone where we lived and our beautiful view of Provo because we are obsessed with it. If you know me, you obviously know that I LOVE LOVE LOVE planning parties. It’s been a long 5 months of no party planning, so it was good to get back to doing what I love. It’s been a HUGE blessing to live with Kari and Jaime again. Also, Camille (Kari’s cousin) is super chill and fun! The planning process has been easy, but I was scared that not a lot of people would show up because it is Orem and it’s not your usual “Provo party” where you can walk in even if you don’t know them. The day before any party that I throw, I get so nervous that no one is going to show up. I don’t know why I get so nervous every time, but I just do and I need to stop. Jaime and I went shopping for yummy treats and lights to light up our backyard. I spent all night Saturday and all day Sunday baking! 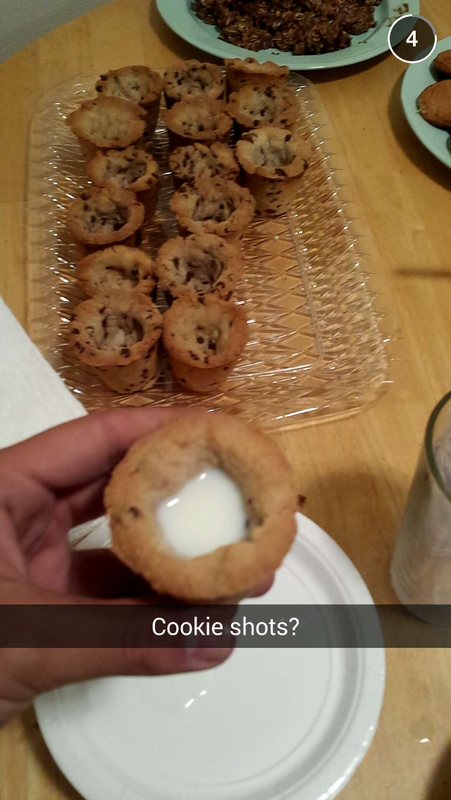 Luckily, I had my friend Steven Johnson helping me bake the chocolate chip cookie shots and Emilee Crowder come over Sunday to keep me organized. haha I love her so much. The party started and the first to arrive was my good friend Zach Stanford!! He was in Boston with me and I haven’t seen him since I left Boston and I’ve missed him so much! People started piling in after him and it was some people we had no clue who they were and some who were my great friends! Everyone loved the yummy desserts. As a host, I’ve never eaten anything at my parties because I’ve been picking at them all day. I wish I did eat some treats, because they looked so good! My good friend Tanner Mouritsen drove all the way down from Salt Lake to come to my party! I’m giving him a shout out because he was one of my great friends who I met in Boston this summer. I made sure to introduce him to all of my friends because he didn’t know anyone besides my other Boston friend, Chris! I loved seeing everyone at our house warming party. My NYC friends, my Boston friends, Village friends, Vegas friends, Study abroad friends, EVERYONE!! So….. Confession: I didn’t take any pics at the house warming party. I screenshot my friend’s Jaron Beckwith’s snap chat story and that’s all I have of proof of the party! haha but it’s okay because I was in the moment and enjoying every second of it. You are all the best.